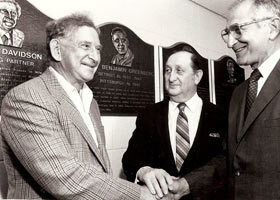 The Michigan Jewish Sports Foundation(MJSF) was the brainchild of founders Alvin Foon, Mickey Fishman, Seymour Brode, Myron Milgrom, William Jacobs, and Robert Steinberg. The Hall of Fame honors the efforts and accomplishments of Jewish athletes and promotes physical fitness and sports activities for American and Israeli Jewish youth. The Hank Greenberg Memorial Golf Invitational is just one of many projects in which the MJSF participates that have a positive impact on the Jewish community. In its first year, the Hall of Fame honored former Detroit Tiger Hank Greenberg, Detroit Pistons’ owner William Davidson, former University of Michigan All-American quarterback Benny Friedman, and former U-M quarterback Harry Newman as its first inductees. Subsequent Hall of Fame inductees include many prominent Michigan sports figures. The success of the inaugural induction ceremony and the accompanying dinner and silent auction prompted the MJSF to make these activities an annual event. Since then, the Hall of Fame Induction Dinner has remained one of the most highly regarded events in the Michigan sports and Jewish communities. The Dinner is preceded by a silent auction of sports items and memorabilia. Receive email updates about our events and foundation giving opportunities.